Serving our Seattle-area clients doesn’t stop at the salon. We are committed to giving back to those we serve and are proud that our efforts help strengthen the community and support the health and well-being of our clients and their families. Each salon has a charity they support and help by providing volunteers, raising funds and awareness. At Gene Juarez Men, we believe in giving back and want to share our success with the community. St. Baldrick’s Foundation donates all proceeds to the Children’s Oncology Group. They continue to grow exponentially, raising more than $12.9 million this year from over 18,000 shaved donators at 402 events. The slate of grants now includes hypothesis-driven research grants, scholar awards and infrastructure support to help local institutions treat more kids on clinical trials, their best hope for a cure. The Men’s Salon (now Gene Juarez Men) has been working with St. Baldrick’s since 2010. 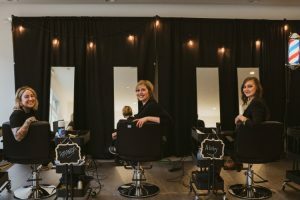 The initial relationship began when a longtime Gene Juarez client, whose son is a childhood cancer survivor, reached out to The Men’s Salon in hopes of creating a new partner for events. They were asked to do what they do best: cut hair—or specifically, shaving it. Gene Juarez Men spends every year at events shaving heads to raise money for St. Baldrick’s; typically 2-5 events occur every year with organizations such as Seattle’s Children’s Hospital and Fado’s Irish Pubs. In 2018, Gene Juarez Men Manager Amanda was knighted for seven years of service, and Abby became a Squire of Hope for five years of service. 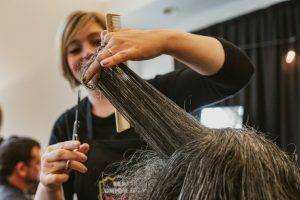 Partnering with Seattle’s Union Gospel Mission, the Designers at Gene Juarez Men volunteered their expertise to those in need. Abby, Amanda, Elizabeth and Jo, with the help of Amie (from our Northgate salon) provided haircuts and beard trims to 50 men coming out of homelessness and addiction. For two days, these ladies cut hair as part of a makeover for these brave men graduating from a special recovery program. Seattle’s Union Gospel Mission calls the event Hope Springs Anew as a representation of the internal transformation of the men in their recovery program. We’re honored to be part of their recovery journey and fresh start.